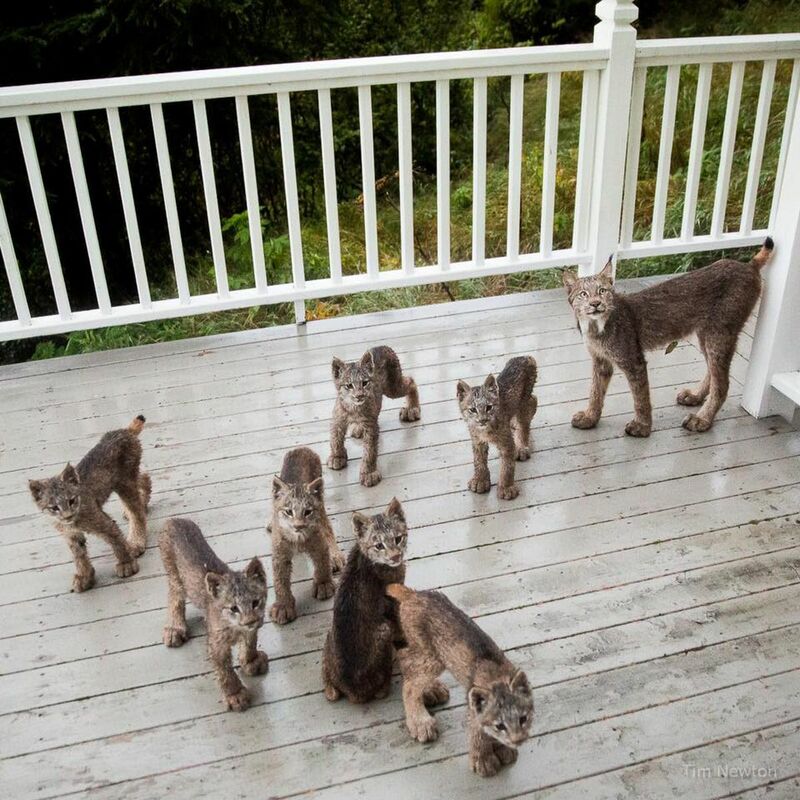 The lynx with seven kits that became a viral sensation in September recently returned to the Anchorage Hillside home where their deck-romping first attracted international attention. This time, the lynx were caught on video, generating new headlines in the Alaska press and new interest on Facebook from worldwide admirers. "People are crazy about the lynx," said Cathy Newton, who caught them playing on video from inside her house on the Hillside. Since the video was posted to Facebook on Saturday, 134,000 people have viewed it there, Newton said. That's small compared to the millions who viewed the photos taken by her husband, Tim, the first time the lynx appeared on their deck in mid-September. Scores of news organizations covered the story. But give the video some time, Cathy Newton said. "People just absolutely love the lynx and they've become very emotionally attached," she said. The Newtons have received thousands of emails and Facebook messages about the lynx, Cathy said. Responding to demand, they started selling calendars, posters, magnets and Christmas ornaments featuring the playful cats. "We did not intend to do these projects. It was all customer demand," said Newton, a part-time mental health counselor. Packaging and shipping the products and responding to questions is like a full-time job, she said. Tim Newton, a semi-retired engineer, said the couple doesn't expect to make money, or certainly not much. They're still paying off up-front costs. But it's been fun talking to people from other continents about lynx and Alaska. So far, he's shipped products to about 10 countries. The couple suspects the felines enjoy the deck because it gets them out of the wet or snowy brush, with a long runway where they can scamper. Cathy Newton's footage shows only five of the kits. But two others played "rambunctiously" in the yard, obscured by the deck's railings, she said. All eight cats look healthy. "Anyone with energy to play around like that, with energy to spare, has some measure of good health," Tim Newton said.